Depending on how long you’ve been following our site, you’ll know that we love mechanical keyboards. We love the feel of them, we love the sound they make, and most importantly we love how using one improves typing speed – a fact proven by counless hours of typrX benchmarking. That said, if there’s one thing stopping most of us from picking up a mechanical keyboard, it’s going to be the cost. Because of the materials used in the production of mechanical keyboards, they simply cost more to product so when you take a look at the mechanical keyboard market today, you’ll be very hardpressed to find good ones near $60. It simply doesn’t exist. However, it seems like AZiO plans to change all that. 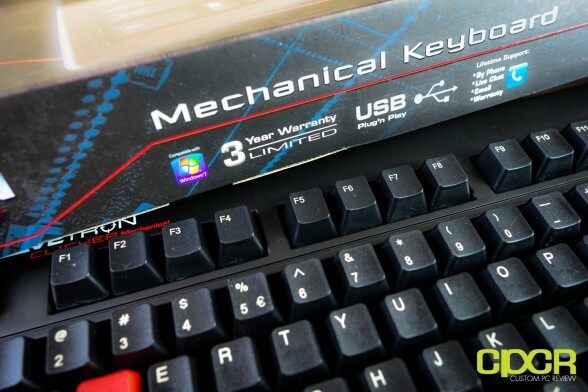 With over 10 keyboard offerings ranging from small wireless entertainment system keyboards to the monstrous Levetron Mech5, AZiO is no stranger to the PC peripherals market and with their newly released AZiO Levetron Clicker Mechanical Gaming Keyboard, we finally have a relatively affordable mechanical gaming keyboard on our hands. As you may have guessed then, today we’ll be reviewing the AZiO Levetron Clicker mechanical keyboard. As a part of the Levetron line, the AZiO Levetron Clicker is a gaming oriented keyboard, similarly to the AZiO Levetron Mech5 we reviewed a couple weeks back. What really helps AZiO’s Levetron Clicker stand out form its competition though is the fact that it uses white ALPS style mechanical switches, which we’ll get into a bit later. How will AZiO’s first budget oriented mechanical gaming keyboard with the rare ALPS style switch pan out? Lets find out! Starting with the front of the box, we get an idea of what the keyboard looks like along with its features. It’s funny how AZiO has contradictory statements right off the bat on the front of the box saying it’s NKRO then saying it’s 18 key rollover. Either way, 18 key rollover is practically like NKRO for typical usage situations. Seems fishy… Let’s move on. 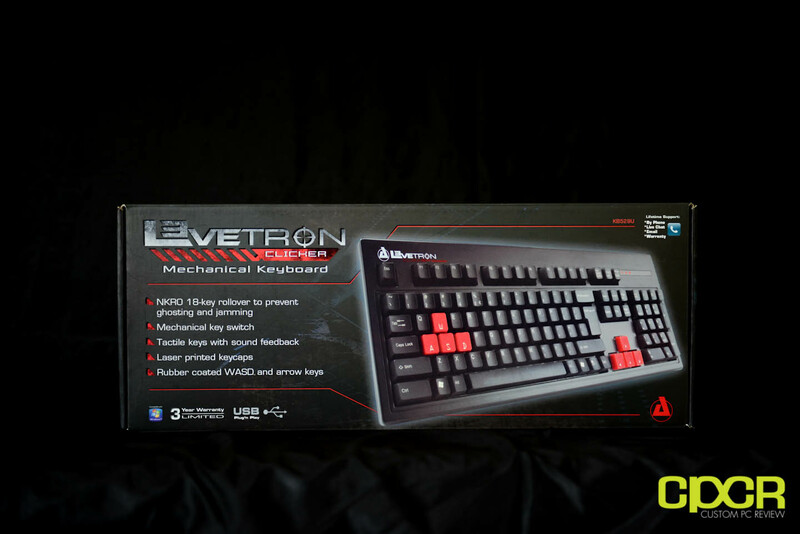 AZiO has kept things nice and clean by providing only the essentials in the box which are the Levetron Clicker Mechanical Keyboard and the users manual. 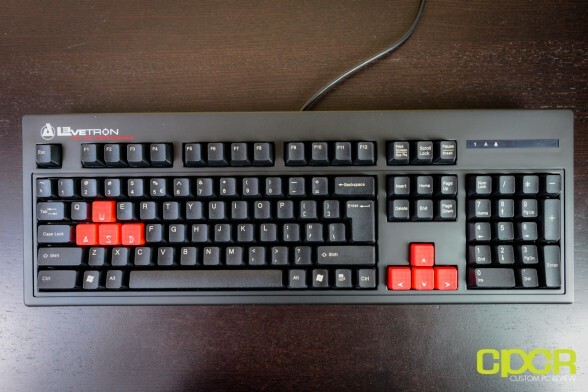 Here we get a full view of the AZiO Levetron Clicker and the first thing that will pop out at you is the large red rubberized WASD and Arrow keys. As a keyboard designed for the gamer oriented Levetron line of keyboards, this is fitting as typically the W,A,S,D keys are used as movement controls. 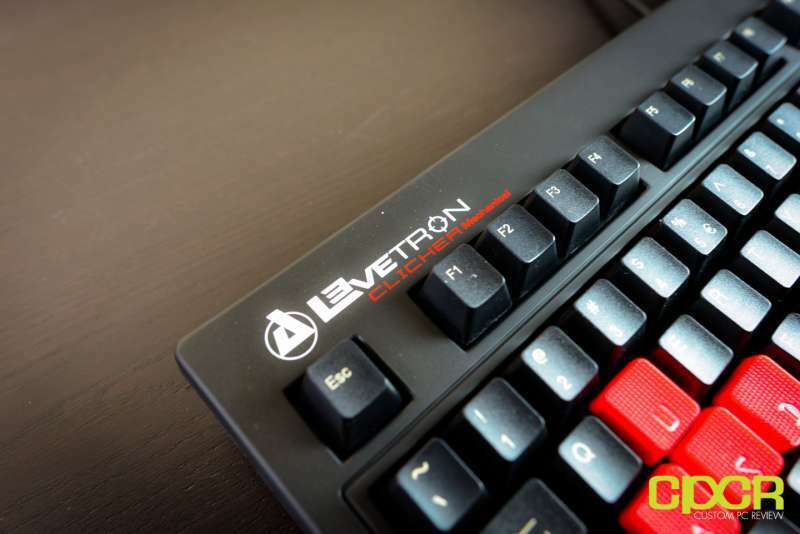 Additionally, you will also notice that for a mechanical keyboard, the Levetron Clicker is quite light, which may be a result of cost cutting measures. That said, if you need a spare keyboard to take on the go, the light weight of this keyboard would make it one of the more portable options out there. As you’d expect then, the keyboard’s body is made entirely out of plastic and is finished in a matte finish so there’s no chance of fingerprints. One thing you’ll almost immediately notice while typing is that AZiO has decided to use a European style layout for the enter key. 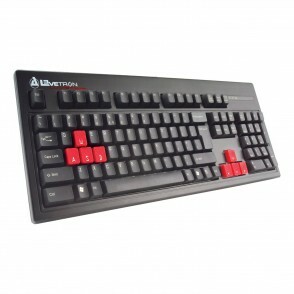 Unlike the standard North American layout which has a long enter key, the Levetron Clicker was configured with the standard European layout which has changed the location of the forward slash and altered the shape of the enter key. That said, we still get long shift keys and the left Ctrl key is actually a bit elongated, which is an excellent feature since most FPS games use the Ctrl button for crouching. Unfortunately, the right Ctrl button is shrunk for this to work, but personally I don’t really use that key so it’s not a big deal. 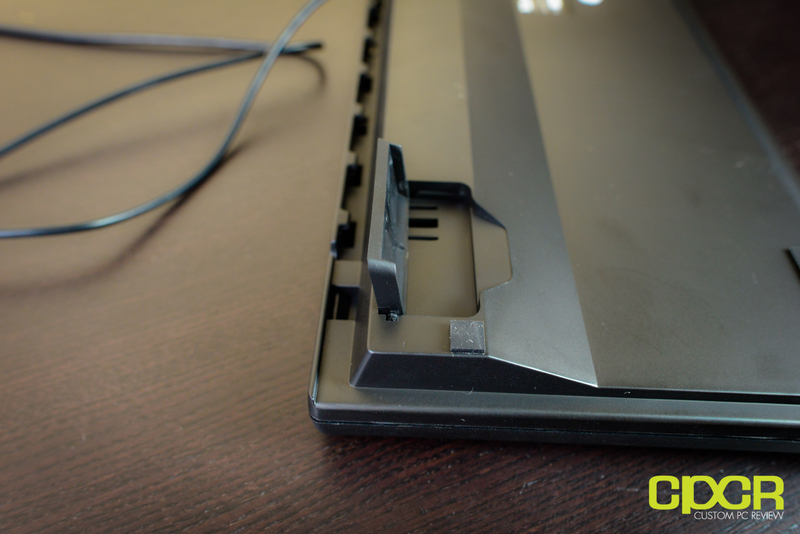 Taking a look at the bottom of the keyboard we see the inclusion of four tiny rubber feet. This is something that typically happens in entry level mechanical keyboards and is known to not provide enough friction to prevent slipping and sliding during intense game play sessions. Taking a closer look at the stands on the Levetron Clicker we quickly notice that they are not rubberized. This is an issue since they do not provide enough friction to prevent slipping and sliding. Additionally, if you have a nice, expensive table, the keyboard has a pretty good chance of scratching it as you pound away at the keys. The Levetron Clicker comes with a single USB connector that’s supposed to support 18KRO. 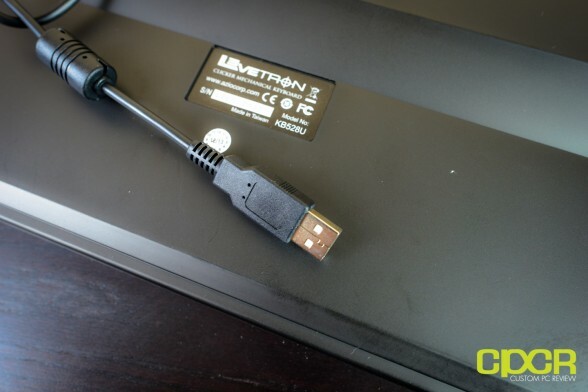 I’m assuming since this is more than the usual 6KRO for USB keyboards, a PS/2 connector is not provided. Additionally, the cord is not braided for durability. Removing a couple of keycaps from the Levetron Clicker, we see that every key has its own individual White Alps switch. These switches are quite different from the Cherry MX style switches that are more commonly used on mechanical keyboards today. That said, these switches are most reminiscent of the Cherry MX Blue Switches since it provides not only a tactile feed back but also and auditory one. What distinguishes the ALPS switch from other switches is that they bottom out earlier at around 3.5mm whereas the Cherry MX switches bottom out at about 4mm. However, the advantage that other Switches like the Cherry MX Blues have is that they actuate earlier at around 2mm, which means that experienced mechanical keyboard users will not need to bottom out for the key to register. The first test I subjected the Levetron Clicker to was First Person Shooters (FPS) gaming by playing some fast paced Left 4 Dead 2. Overall, I found that the Levetron Clicker performed rather well here. The larger rubberized WASD keys felt very grippy during game play and allowed me to side step masses of undead with ease and swiftness. 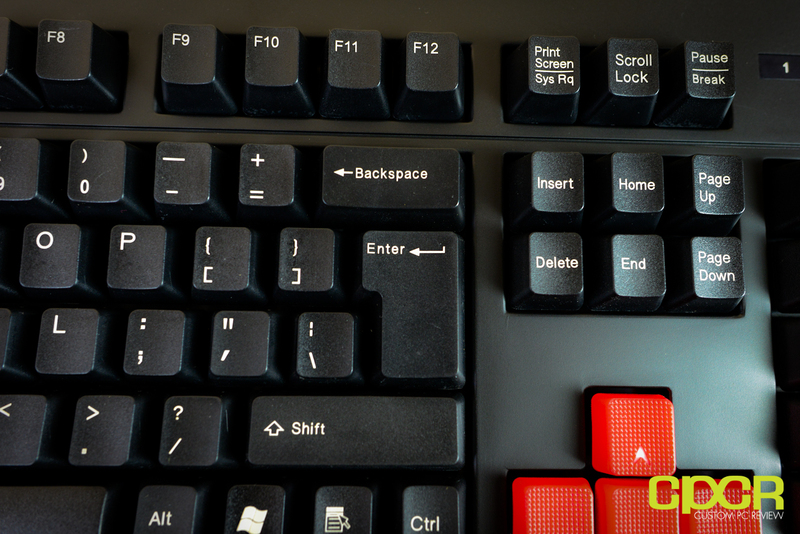 Additionally, the large sized Ctrl button is especially noticeable here as well. In addition there was absolutely no ghosting seen during game play and all actions whether it was cleaving the head of a zombie with an ax or throwing a jar of boomer vial were performed instantaneously. For my second test we pitted the Levetron Clicker against a Real Time Strategy (RTS) game. Like our FPS tests I saw absolutely no ghosting through my play through on StarCraft II. I personally enjoyed the tactile and auditory feedback as I smashed buttons down in a race to build the fastest army. Here is where most entry level keyboards have encountered issues in the past. Since most non-mechanical keyboards usually support 4-6 simultaneous key presses they often run into issues on fighting games, the Levetron Clicker actually supports up to 18KRO so I had no issues whatsoever here even with two players madly button mashing keys away. Having never had the opportunity to test out Alps Switches, I was really eager to test the typing performance of the Levetron Clicker. In order to conduct my tests I used this touch typing test site and proceeded to perform a typing test with my laptop’s keyboard (Dell Studio XPS13, possibly the worst case scenario) followed by a new test using the Levetron Clicker. So that the results would be accurate I performed these test 3 times and the results are below. If you want to know how fast you type, feel free to try it out for yourself after you have finished reading this review… of course. As you can see from my testing above, my overall speed improved by 15% and my typing using the Levetron Clicker has improved more than what I’ve seen from Cherry MX Brown, Cherry MX Red and Cherry MX Black keyswitches. For comparison, I had a 5.75% speed improvement by switching to Cherry MX Blacks and averaged an 11% improvement on Cherry MX Browns. I’ll attribute this performance improvement in my typing speed to having both the auditory and tactile feedback. Additionally, I’ve discussed this with the Editor-in-Chief, Sam, and we are in agreement that Cherry MX Blue style switches with both the auditory and tactile feedback like what we’re seeing here with the White ALPS style switch is our favorite choice for typists. 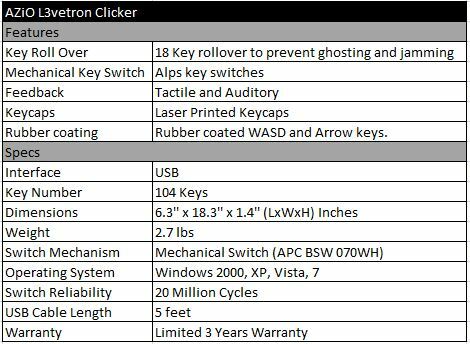 After having positive test results on the fighting game tests I decided to find out the true X Key Rollover capabilities of the Levetron Clicker. To my surprise, I found that the Levetron Clicker really has about 8KRO. This means that you will be able to hit any 8 keys down and they will register instantaneously however once you add a 9th or 10th absolutely nothing will show up. 8KRO is still way more that enough for the average user who typically will at most hit 3 keys simultaneously CTRL + ALT + DEL. *hehe* Seriously though, if it has even the standard 6 key rollover, I think it’s enough for most users out there. That said, I am a bit bummed 18 key rollover is advertised when it’s actually only 8. Dealbreaker? Depends on you I guess, but it passed all my testing until this last one without any issues. Overall impressions on the Levetron Clicker’s gaming performance were excellent. Whether it was a FPS or and RTS the single player performance showed absolutely no ghosting and gameplay was quite enjoyable. 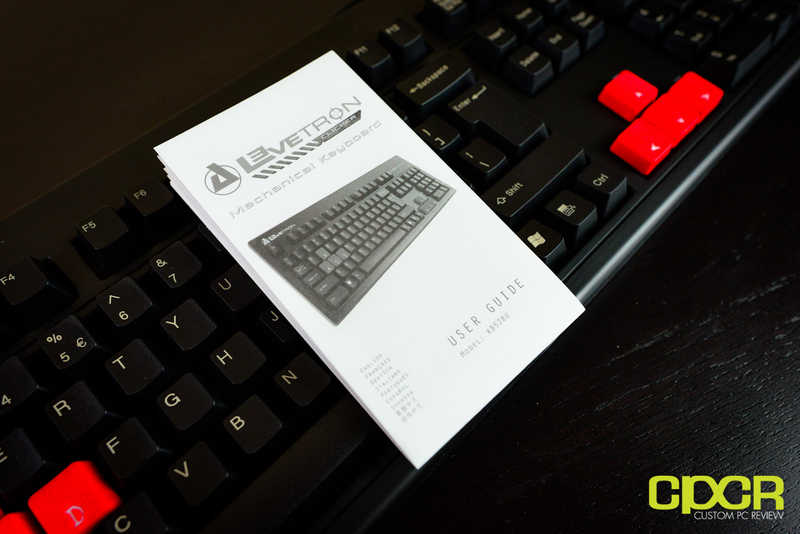 The Levetron Clicker was able to perform even on the hardest gaming test, the two player head to head fighting genre, which isn’t an easy task for most keyboards out there that are limited to the normal USB limitation of 6KRO. 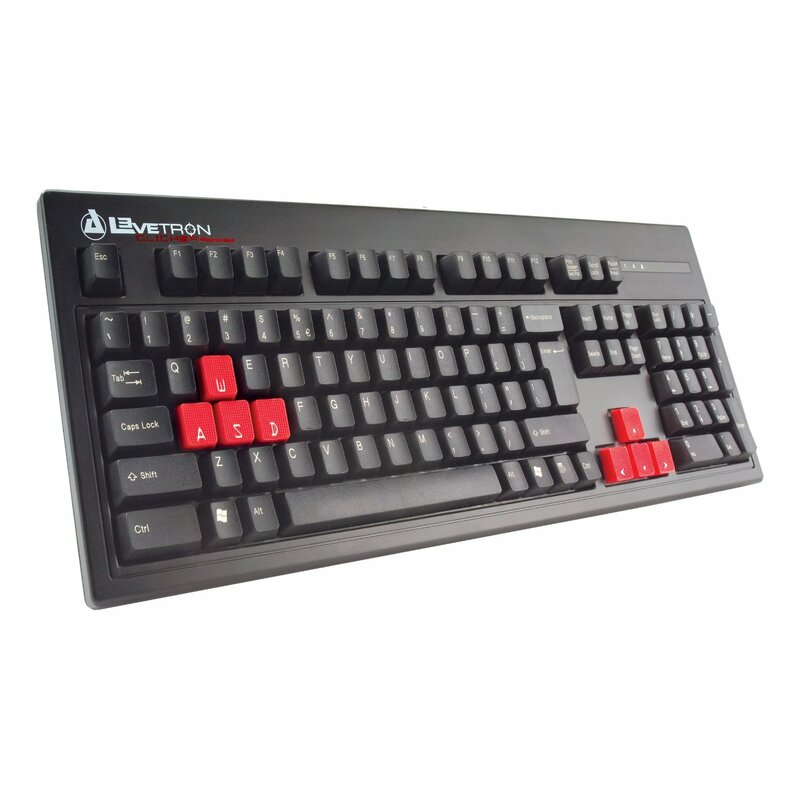 This genre is the “Achilles Heel” of even some top end keyboards that are available in the market such as the CM Storm Trigger, and the Levetron Clicker’s brother, the Levetron Mech5. In addition, both FPS and fighting games get an added bonus from the large rubberized WASD keys as well. These keys helped keep the fingers always in the proper position and even in the maddest of bouts, I was able to perform Hadoukens with ease. Other performance improvements I saw with this keyboard is the typing speed. Despite being initially worried that the rubber keys would impact my typing speed due to the different feel of the key, in reality it really didn’t. Since I’m a huge typist and I need to type loads of reports for work and reviews as well, this is definitely a good keyboard for the purpose. In terms of issues, I’ll just summarize my findings. First, there’s the tiny rubber feet. 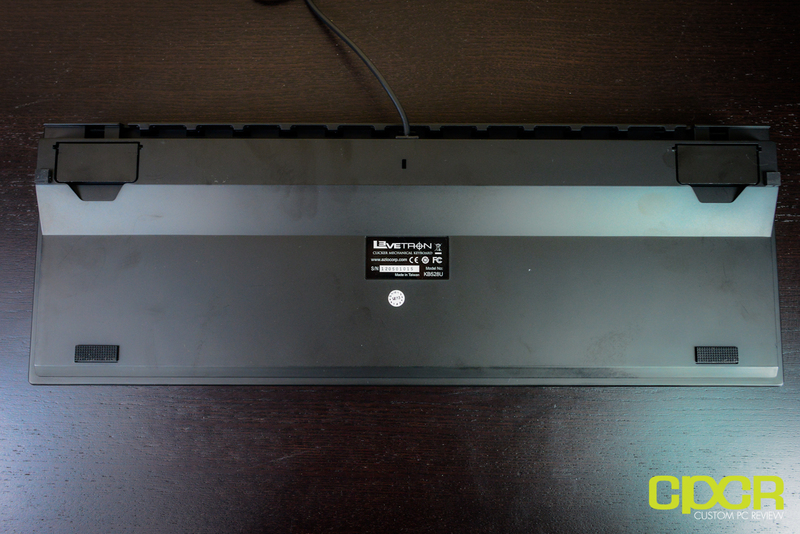 During testing, especially with the stands raised, there was little to no anti slippage going on so the keyboard would actually shift locations during gaming, which is not good. Luckily it was easy to feel the rubberized keys, so I was able to find the keys fairly quickly. Next is the European style enter key. Don’t like it. Still not used to it. That said, Europeans use this layout every day so it’s all down to muscle memory. Finally, there’s also build quality. For a $60 mechanical keyboard, I wouldn’t expect this keyboard to be a tank and it really isn’t. That said, if you treat your computer gear properly, this keyboard should last a long time to come. Also, there’s that 8 key rollover thing, but I’m not going to call it a downside since it passed all my testing. The AZiO Levetron Clicker is currently available on Amazon for $59.99, which like I said earlier makes it an incredible deal for a full sized keyboard. Few good mechanical keyboards come in at this price and even fewer feature gaming specific features such as rubberized keycaps and enlarged Ctrl keys, which are quite obviously gaming oriented designs. I hope AZiO will offer additional rubberized keycaps along with standard keycaps though. 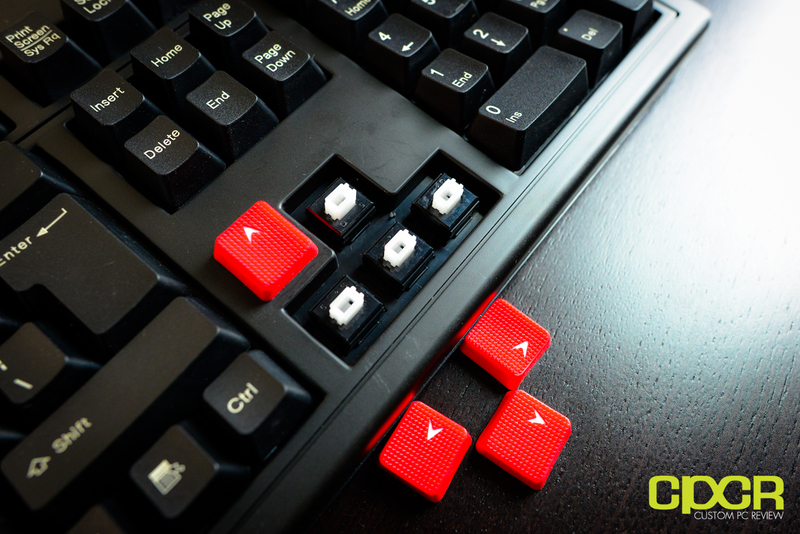 I can see the number keys in rubberized keycaps being quite useful. 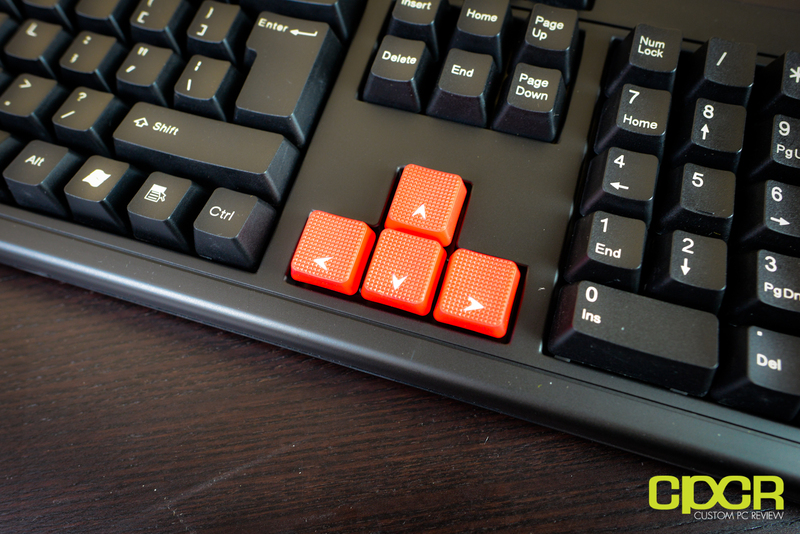 If you want a keyboard that will improve your typing speed, is excellent for gaming, and wont break your bank, the AZiO Levetron Clicker is the keyboard for you. Special thanks to AZiO for making this review possible! The AZiO Levetron Clicker is currently available on Amazon. During the day Michael Chang is a Process Integration Engineer, where he researches and develops MEMS technologies for logic and memory testing. 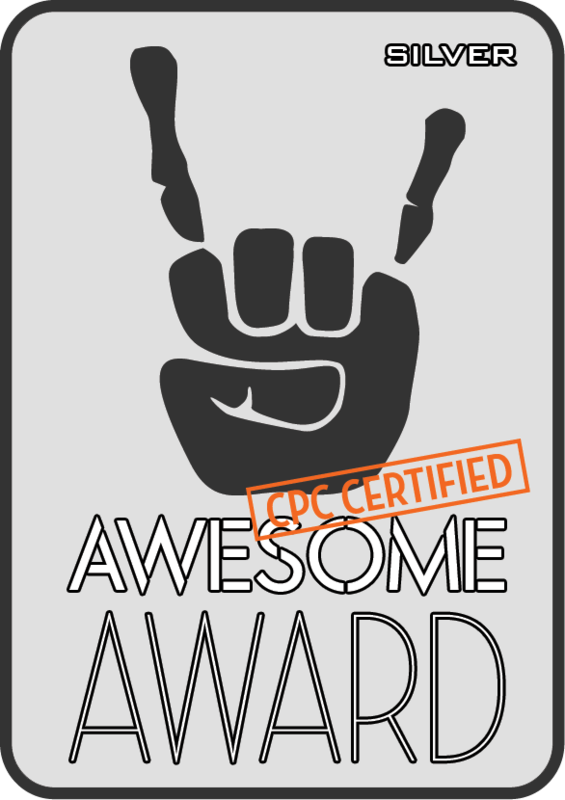 He has been a tech enthusiast for well over a decade and applies his analytic mind to both his reviews and work. Do you have issues with double tapping with this keyboard like blue switches? I might get it for Starcraft 2, but my high APM might cause issues.